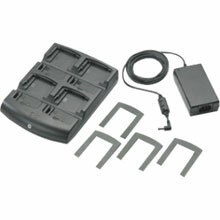 Motorola - Energy Star 4-Slot Battery Charger for MC70, MC75 and MC3000. Charges spare standard and high capacity batteries. Includes Shim for MC70/MC75 and Power supply (PWRS-14000-148R). Must purchase 3 Wire AC line cord separately.